This is a companion GeekList to the last GeekList I created in July, entitled "Best Birthday Ever!" that can be accessed at http://www.boardgamegeek.com/geeklist.php3?action=view&listi.... Back in July for my Birthday I acquired 19 new games, and pledged not to get any new games until Christmas (5 months! ), and almost kept my promise to myself. I broke it on two occassions, the first was to buy San Marco and Elfenland from FunAgain during the $10 Sale, and the second was to add RA to a friend's order from Thought Hammer to push it over the $100 free shipping threshold. Other than that, I have been good, and I have made sure to play everything I got back in July at least once if not more, before going on this second splurge. As you can see below, I got a lot of games, both as gifts and for myself, and now I will make a new pledge. I will aim not to get any new games until May (another 5 months! ), which is when my anniversary is. Alright, without further ado, these are the games that made this the best Christmas ever! I received Australia from my parents for Christmas. I gave them a list of 7 games I wanted (Maharaja, China, Age of Steam, LOTR: Confrontation, Penguin Ultimatum, Ingenious, and Australia), secretly hoping they'd get all of them, but certainly happy to get one. I've since played Australia twice. I played it on Christmas day with my dad and younger brother, but made the mistake of destroying them both by over 100 points. They're both smart and understood the rules, but I guess my minimal experience with other Kramer/Kiesling games and eurogames in general gave me a distinct advantage. I also played on December 26th with my girlfriend and her cousin, and came in second, with my girlfriend winning. I'm glad I got this game. It was actually the last game in my ranked Christmas wishlist that I gave my parents, but it's proven to be fun and easy to teach. While I definitely like Torres better, it seems that the people I play with enjoy this better, perhaps because it's less abstract and more engaging. My older brother gave me Farlander for Christmas. He has been working in Estonia for the last few weeks, and got everyone in the family something from Estonia, which he brought back with him to New York. It actually looks interesting, and I'd love to try it out. However, the brand new shrink-wrapped game box was missing the seven board pieces. My e-mails to the company have gone unanswered, and I'm not sure what else to do. Too bad, I would have liked to try this one out. P.S. I was sad to see I couldn't add it to the database, and surprised to see it already in there. After reading this thread (http://www.boardgamegeek.com/article/734665) a little while back, I asked how one could go about purchasing the Spielbox expansion for St. Petersburg with cash (rather than GeekGold), and received a very nice GeekMail from user "kvn299" telling me to contact Barbara Nostheide at barbara@nostheide.de to order it. 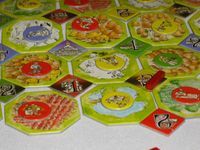 I went ahead with ordering not only the St. Petersburg expansion, but also Die Katharer for Carcassonne and Die Fischer von Catan for Settlers, all of which together cost a total of 24.60 Euro (15.60 for the three magazines with expansions and 9 for shipping). I ordered these for myself during my law school final exams a couple weeks ago, and they were here at my NYC apartment waiting for me when I returned home from visiting my family. I definiely didn't expect them to arrive so quickly. I have since tried to pass on the info about how to get these expansions by posting another thread (available at http://www.boardgamegeek.com/article/736712) and replying to GeekMail inquiries about obtaining these Spielbox expansions. See above description regarding my purchase of this Spielbox expansion for Carcassonne. Since I already had River, Inns/Cathedrals, Traders/Builders, King/Scout, Count, and Princess/Dragon, I just had to have this one. Now that the German magazines have arrived, it makes me really wish I knew more than "Danke" and "Bitte," so I could read them. Looking forward to trying this one out, although the number of tiles is getting a little out of control now (I'm worried my games are going to end up looking like image 69570 eventually). See above description regarding my purchase of this Spielbox expansion for Settlers of Catan. After playing vanilla Settlers for many years, I finally got Cities/Knights and Seafarers about 9 months ago, and have enjoyed both. Since I was already ordering the St. Petersburg and Carcassonne expansions, I decided I had to have this one too. P.S. I thought about ordering duplicate copies of all of these Spielbox expansions for sale on the BGG Marketplace or on eBay, but after checking prices, it didn't really seem worth it. If only the Euro exchange rate was back at 80 cents, like it was when I studied abroad in Athens in 2002. 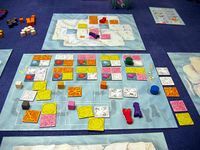 Reef Encounter was the first of six games that my girlfriend ordered for me for Christmas. She actually placed the order (with my helpful suggestions) back in October on Thought Hammer, when all of the games were still pre-orders, and at this point in time, three of them are now available, and three are still not ready, so the order is sitting in a warehouse in Texas. As explained below, I hope to have Thought Hammer send the three available games with an order I placed for myself yesterday. I guess I'll find out if that's possible when they get back from vacation on January 3rd, 2006. 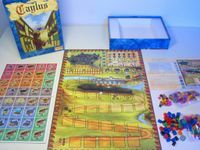 Yes, Caylus, the game that spawned a thread with 14 pages of posts, 344 different posts, and 60 thumbs up (see http://www.boardgamegeek.com/thread/90227/). I know, I know, I succumbed to the H-Y-P-E. But I really think I'll like this game, I was bummed reading about what a great time everyone had at Essen, and wanted to feel like a part of the Essen-sanity, so I added Caylus to the cart. Very unlike me, since I generally have been getting older games, the tried and true, with lots of SDJ, IGA, and DSP recognition. Well, I've managed to catch up on a lot of old eurogame titles this year, so I thought it was time to splurge on a "cutting-edge" game. Well, it'll be nice to have the 1st edition, rather than the 2nd (which is what I tend to be stuck with it seems for most games), when it arrives. This definitely seems like the kind of game I'll like, since I love the big box Alea games I've played, and the heavier euros rather than the "fillers." We'll see, I'll wait to rate it until I've played it (even though I am sad about my favorite E&T getting bumped). 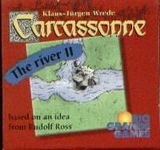 Carcassonne: The River 2 was the third "game" from my girlfriend, and is the third and last available game on Thougth Hammer. This one was only $4 so I wanted it even though I'm not a huge fan of the original River. Originally, I also had included two other expansions (El Grande Expansions and Powergrid: France/Italy), but cut those out because I realized for about the same price I could include a whole other game (that being Tempus), and I'd never played El Grande yet and wasn't an enormous fan of Powergrid. P.S. I can't wait to make a gigantic super river combining both together. 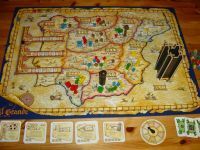 El Grande was the fourth game from my girlfriend for Christmas, and the first game from that October order that is not yet available. According to the RGG website it's been delayed until "2006," which is sad because it used to say "early 2006." To rescue the three above games that are now ready and available, I've placed another order (for most of the games on my wishlist to my parents that they didn't get) and asked Thought Hammer to send them with the more recent order. I've been looking forward to the El Grande reprint for just about forever, so I'm happy to wait a little longer, I remember when I thought I'd get it for my birthday 6 months ago. Goa is another one I've been looking forward to for a very long time, and now there are printing problems, argh. Ah well, I knew what I was getting in for when I asked my girlfriend for 6 pre-orders. Although I'd never ordered pre-orders before, I had a feeling there was no way it'd be here for Christmas, but that's okay. These were the games I really wanted, but couldn't ask my parents for because they'd really want their gifts to definitely be under the tree by the 24th. 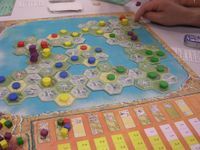 Tempus - As I said before, I normally don't go for newer games, preferring instead to get the tried and true older eurogames, but I was caught up in the Essen-spirit, and my GeekBuddies really recommended this one to me, and I respect their ratings, comments, and advice, so I had no choice. Plus it was about the same price as the expansions I cut (El Grande Expansions and Powergrid: France/Italy). I'm a sucker for modular boards, and the pictures of this game really appeal to me for some reason. Moreover, I lost in the BGG contest for it, and I couldn't bear it, hehe. This entry is actually a stand-in for "Scene It? Sports powered by ESPN," which my girlfriend received from her family for Christmas. Played it once with her and her brother and sister already, and got killed. I think she got it so she could destroy me at it, hehe. I have submitted this Sports version of Scene It to the database, and am awaiting approval. I was surprised to find it missing, whereas I was very surprised to find Farlander (above) already entered. 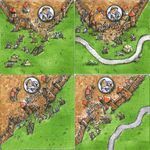 Perhaps it's already been submitted by someone else and is just awaiting approval, that's what happened with the new Carcassonne expansion for next year (The Tower), which I read about on Boardgame News, and noticed it wasn't in the BGG database, and almost submitted it, but realized someone else must have, and sure enough the very next day there it was. 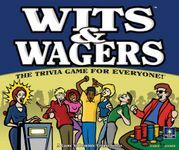 After watching Scott Nicholson's TV spots (http://www.boardgamegeek.com/thread/90828/), my interest in Wits & Wagers was piqued. I'd entered the BGG contest and lost, and after seeing what this game was all about from Scott, I mentioned it to my girlfriend, and she loved the idea. She's a huge fan of trivia games (probably because she crushes me at them), and also enjoys gambling, so this game seemed perfect (especially because I might stand a chance, however small). Anyway, she put it on her list immediately yay, and so I got to get her a game for Christmas for a change of pace. Anyway, thanks Dominic Crapuchettes and Eagle Games and North Star Games for designing a trivia game that I might hopefully actually enjoy playing, what a great idea. 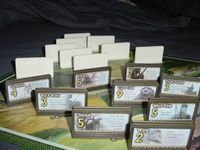 Also, as Vickie Watson (BGGmom) has said (see http://www.boardgamegeek.com/thread/88410), I think the mousepad-esque board is an awesome idea. This was the number one game on my Christmas wishlist I gave to my family, and since I couldn't find it under the tree, I made an order for myself from Thought Hammer on December 29th. This was the first game to go in the cart. I've really enjoyed the other Kramer/Kiesling games I've played (Torres, Tikal, and Australia), and everything that has been said about this game really appeals to me. My GeekBuddies had the final say, and they collectively and emphatically said yes, hehe. I had trouble deciding whether I wanted to try to get Web of Power, or just settle for China, and eventually decided that China would have to do. I just don't really like used things, like used board games, and finding a new copy of Web of Power didn't seem very feasible. Anyway, I like area control games, like San Marco, and this seemed like a good addition to my burgeoning collection. I'm one of the few who did NOT like Lord of the Rings by Reiner Knizia. I know, I know, I'm very much a member of the Cult of Reiner Knizia (see Matt Monin's GeekList at http://www.boardgamegeek.com/geeklist.php3?action=view&listi...), and also a serious LOTR fan, but for some reason didn't enjoy this one. I think I generally don't enjoy cooperative games, I suppose. Anyway, I decided to give Herr Knizia another chance to woo me with an LOTR-themed game, so I added this to the cart. I need more two-player games, and I loved Stratego as a kid, so I think this will be a homerun, rather than the strikeout that was Lord of the Rings, but we'll see. I was torn over whether to wait for the Deluxe version, but since I've never even played this (I'm the main purchaser for my game group, as is the case with most of you I would guess), I decided to just go ahead and get the regular version. I haven't bought any really silly looking games before, sticking mainly to games like Princes of Florence and Traders of Genoa and Tigris & Euphrates. 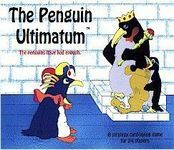 But I'm a huge sucker for penguins, and every other section of my Christmas wishlist had a penguin-related thing (the DVD section included March of the Penguins, and the Books section included OPUS: 25 Years of His Sunday Best), and after seeing this boardgame, I had found my penguin-related entry for the boardgame section of my wishlist. Well, it was not to be, so I had to make it be. For $12, I don't think I can go wrong. Just rewatched March of the Penguins to get in the spirit, and have been reading more Bloom County too. Keythedral was the first of two games I put in this Thought Hammer order for myself, which were not on the Christmas wishlist to my family. Of the seven on that list (Maharaja, China, Age of Steam, LOTR: Confrontation, Penguin Ultimatum, Ingenious, and Australia), I got the last one as a present, and ordered 4 of them for myself. I decided not to get the other two (Age of Steam and Ingenious) because the first was so expensive, and I'm not sure I could get my group to play it, but I still want it at some point perhaps, I guess I'll try out some other Martin Wallace games first, and the second (Ingenious) because I play it all the time on BSW (http://www.brettspielwelt.de/), and don't think I really need it in person, plus a friend recently bought this. Anyway, after playing and loving Reef Encounter, I looked around for other Richard Breese games, and started reading about Keythedral, and had to have it. There were also two GeekLists I read recently, the first was called " Top rated games on BoardGameGeek from A-Z" by user Xelvonar (http://www.boardgamegeek.com/geeklist.php3?action=view&listi...), and the second was a similar list called " A, B, C . . . 1, 1, 1, -- An Alphabetical #1 List" by user baub64 (http://www.boardgamegeek.com/geeklist.php3?action=view&listi...). There weren't many games with staying power, but one of them was Keythedral, which piqued my interest in it. I'm definitely looking forward to trying it out. The last game in my December 29th Thought Hammer order for myself was Carcassonne: The Castle. For a while now I've put off buying any of the Carcassonne stand-alone games because I enjoy the original Carcassonne so much (as evidenced by it's #2 ranking on my Personal Top 10), and have invested so much in all the expansions. Anyway, I finally caved and bought Hunters & Gatherers for my board game club at Columbia Law School (see http://www.columbia.edu/cu/csss/) with the club's budget. I enjoyed it, and started looking into all of the other stand-alones. I also played a friend's copy of The City. I guess I've realized it might be worth getting stand-alone copies for my own collection, so I decided this was the one for me. First of all, as I said above, I need more strictly two-player games. Second, I'm in the cult of Knizia. Third, being able to fit a Carcassonne game on my table and not having to play on the floor sounds great. Fourth, I took it out of the cart at the last minute, but my girlfriend actually asked me to put it back in, Carc is one of her favs, so that was certainly motivation enough to include it in the order. P.S. Wow, exactly 19 games, just like my last "Best Birthday Ever!" GeekList (http://www.boardgamegeek.com/geeklist.php3?action=view&listi...), it must be a sign. Although, I can't say I'm sure what it means. P.P.S. 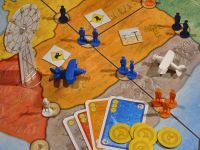 Thanks for taking the time to read all the way through my rambling thoughts on the games I've been given and given myself this December (and on into January, or further depending on when El Grande, Goa, and Tempus are available). So with that, I am done, and will try to hold out until May. Hey, it almost worked from July through December. P.P.P.S. I just wrote my very first review ever! Check it out and let me know what you think. 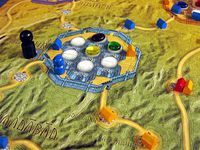 It's a review of Through the Desert, and can be found at http://www.boardgamegeek.com/thread/91323. P^4.S. The two games that almost made it in this order, which barely didn't were Tower of Babel and Santiago, both of which I've read good things about lately. As it stands, those two games (along with Age of Steam) will be the three games at the top of my 6th-year Anniversary wishlist in May (unless RGG changes their mind about the Wallenstein reprint, or manages to get Taj Mahal out by that time).